Misunderstanding is a common cause of negotiations breaking down. Such breakdowns may occur due to differences of viewpoint, background or cultures as well as many other factors. In negotiation especially, it is possible not to ‘hear’ what others intend to say due to lack of assertiveness on the part of the other person or ineffective listening. This page covers some ways that misunderstandings in negotiation can be reduced helping to pave the way for a successful negotiation. It is essential to have a clear understanding of what the other side is seeking to achieve. This is not always what they initially state as their aims. Looking at interests often allows for an understanding of the real goals. Similarly, it is worthwhile clearly stating what your own goals are so that both parties can work together to seek mutual benefit. Hardened ‘old school’ negotiators such as old-style union officials will often maintain that stating your goals undermines your position. This is only true if you are using a ‘Win-Lose’ negotiating style. If you are looking for common ground, and a ‘win-win’ situation, then stating your goals assertively and openly is the first step to success. Our page on Negotiation in Action sets out the differences between positions and interests, which may help you to understand why initial aims may not be the same as actual goals. You may also find it helpful to look at our page on Dilts’ Logical Levels to explore this idea further. It is important to identify the real issues involved and discard those that are not relevant. This enables the focus of the negotiation to remain firmly fixed on the interests and differences of the individuals involved, without argument spreading to other areas of work. You may find it helpful to write on a white board or flip chart the areas of interest, and those which you have agreed are not relevant for the discussion. That way, if one person goes off at a tangent, others can point out what was agreed. Remember, though, that as negotiations proceed, other areas may become important, and may need to be added to the list. Different people have different interests. What you regard as essential may be viewed by someone else as trivial. By setting out all the issues clearly at the beginning of the negotiation, and also making clear which are more valuable to you, ‘win-win’ areas become clearer. During negotiation, a great deal of time can be spent in establishing the facts. However, it should be realised that ‘facts’ tend to provide another area over which to disagree, because people can see the same situation and events in completely different ways. Another person’s worries, even if totally unfounded, are still real worries and need to be taken into consideration. Conflicts often arise because of differences in personal viewpoints. Remember that to accept and understand someone else’s viewpoint does not imply agreement with that point of view. Rather, it shows respect for the person and the wish to work together to find a mutually satisfactory solution. Similarly, it is helpful to encourage the other person to understand your viewpoint. An open, honest and accepting discussion of the differences in perspective will often help to clarify the issues and provide the way forward to a resolution. Good communication skills are essential for negotiation. Improving and developing your communication skills will help to minimise the problems associated with misunderstandings in negotiation. You may also find it useful to read our pages Barriers to Effective Communication and Communication in Difficult Situations to help increase your understanding of what can go wrong in communications between individuals. This in turn will reduce the chance of misunderstandings. By developing a good understanding of communication, you increase the possibility of successful negotiation. But even more importantly, you maintain your relationship with the other person or people for the future. Spending time clarifying and agreeing what all individuals have said (rather than assuming that you know what they intended to say) will ensure that misunderstanding of meaning is kept to a minimum. It’s also important to listen to their replies, to make sure that you really have understood and paraphrased correctly, otherwise you perpetuate the misunderstanding. Good negotiation involves offering your viewpoint in an assertive manner, rather than taking an aggressive stance, or passively listening to different views. By being assertive you will help to ensure that the needs of all concerned are met. See our pages: Assertiveness and Assertiveness Techniques for more information. 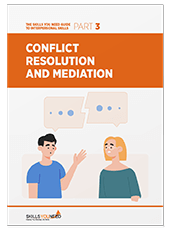 Learn more about how to effectively resolve conflict and mediate personal relationships at home, at work and socially. Negotiation is a process by which people resolve disagreements. Structured negotiation follows a number of stages from preparation through to implementation. If possible, a WIN-WIN approach is more desirable than a bargaining (WIN-LOSE) approach. This involves seeking resolutions that allow both sides to gain, while at the same time maintaining good working relationships with the other parties involved.